We are pleased to introduce our first Qur’an course for sisters. It will be led by Ustadha Zaynab Caunhye, a Hafidha of the Holy Qur’an. We are blessed with the opportunity to learn from such an experienced and skilled sister. She graduated from IESH Château-Chinon and is qualified to teach tajweed, with 5 years of experience. 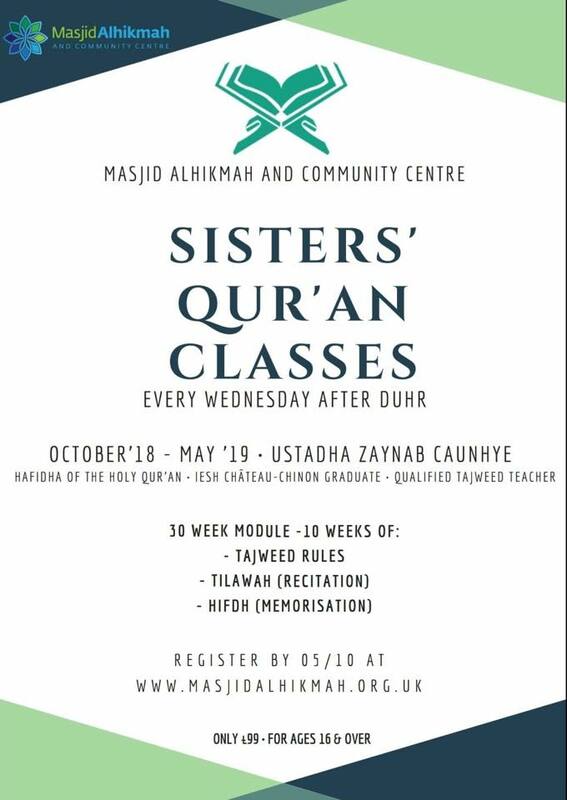 This intensive course is open to keen sisters aged 16 and over and requires a weekly commitment. It will run for 30 weeks on Wednesdays after Duhr prayer. If you are interested, please ensure you register at https://form.jotformeu.com/masjidalhikmah/MAHSQURAN before the deadline of Friday 5th October 2018. Spaces are very limited. For those who register and successfully secure a place, supporting material will be provided.